We were unusually warmly welcomed (in that the sun was shining) to Glasgow last week for the 41st annual MEG conference. Hosted by Glasgow University and organised by Andy Mills. Glasgow is currently leading a collaborative three-year research project with Kew and the Smithsonian entitled ‘Situating Pacific Barkcloth Production in Time and Place’, not surprisingly conference delegates were treated to a plethora of papers about barckcloth, not only from the Pacific but also from South East Asia and Africa. This year’s theme focused on textiles, attracting a high attendance to the conference of MEG members old and new and colleagues from New Zealand, America and Europe. 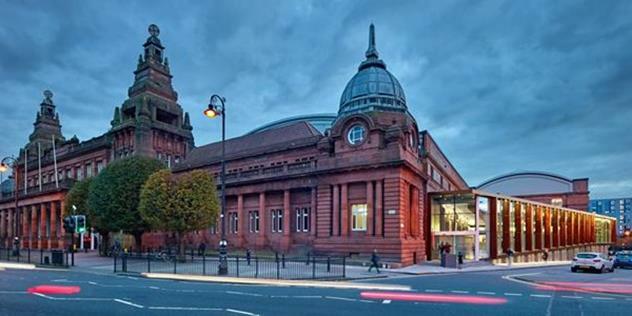 The conference took place in the very modern Kelvin Hall opposite the imposing Baroque architecture of the Kelvingrove Museum and Art Gallery. Having been working on the textile collections at the Pitt Rivers Museum (PRM) I was excited to hear from colleagues of research across cloth and costume, having had a glimpse at some of this research earlier in the week when I was invited to the Museum ofArchaeology and Anthropology, Cambridge, to attend a workshop on Kiribati armour. The programme was packed and so started promptly with the first session concentrating on costume in the Americas. Tony Eccles, Royal Albert Memorial Museum Exeter kick started things with a paper on the tensions of repatriating Crowfoot’s regalia in the collections at Exeter back to the Blackfoot community in Canada, an unresolved issue. Steeve Buckridge, Grand Valley State University, Michigan, gave the first of our many barkcloth focused papers. He had specifically studied lace bark in Jamaica. Lace bark played an important role in the fashions and the role of reclaiming and asserting femininity of enslaved African women who nurtured and retained the skill in lace bark production. Buckridge brought to the fore issues of sustainability, the native lace bark tree is now facing extinction, what is the future for the tree and how can lace bark production be renewed and utilised by local people in the Caribbean? Callie Vandewiele, University of Cambridge, then took us to Guatemala where textiles hold special value. Callie digitally repatriated textiles in Museum collections from Europe back to Mayan Guatemalan weavers who through this process are able to regain textile knowledge, patterns and designs. Pat Allan, Glasgow Museum, spoke of her fieldwork carried out in the Tigua region of Ecuador from 2011-2015. Glasgow Museum acquired a collection of wooden masks from this region, a brief departure from the conference theme of cloth and costume but relevant given the use of these masks in dance and performance. Given the pace of the conference time for questions was limited so we took a welcomed coffee break to ponder the morning session before returning to the second session of the day looking at the work being done by the Pacific Presences team at the Museum of Archaeology and Anthropology (MAA) Cambridge. The Pacific Presences Projects lead by Cambridge examines Oceanic art in the context of European collections. The project is a five-year project funded by the European Research Council. The first paper presented objects and photographs amassed by the Charles Templeton Crocker expedition to the Solomon Islands, in particular the little researched material culture of the Islands of Rennel and Bellona. More specifically Lucie Carreau spoke about Kongoa, a type of bark cloth garment worn by men, women and children. Lucie reminded us that when such objects enter Museum collections they are changed, they become flat pieces of cloth, they are no longer kongoa, as this status for the object can only be achieved through the wearer of it and how it is worn depicting the social status and circumstance of the wearer themselves. Alison Clark along with New Zealand/Kiribati artists Chris Charteris, Lizzy Leckie and Kaetaeta Watson introduced ‘The Island Warrior’ and their rethinking and reinterpretation of Kiribati armour. Both a historical costume from Cambridge and the new reworked costume made by Chris, Lizzie and Kaetaeta are currently on display at MAA. To achieve this, it was necessary to research and evaluate historical armour in collections across the UK and Europe and to apply a multi-disciplinary approach involving research, conservation and artistic interpretation. Erna Lilje’s paper focused on fibre skirts from central province, Papua New Guinea and the dimensions of interconnection in the process of manufacture and production of these grass skirts. The session was concluded with Nick Thomas’s paper ‘The Travels of Textiles from Cook’s First Voyage’ and the remarkable discovery of a barkcloth sample book pre-dating the Shaw sample books of 1787 (such as the one in the PRM"S collections) and how such sample books exemplify bigger histories and paradoxes surrounding barkcloth. Over lunch delegates were invited to visit the Hunterian costume lab, take a tour of the Centre for Textile Conservation and Technical Art History or watch RAI film footage. Given that over lunch we also had to find time to eat I did not manage to fit in any of these activities though I would have liked to have visited the costume lab or conservation centre I also needed to allow my brain some space before the afternoon sessions commenced. In the penultimate session of the day we heard from colleagues working in textile conservation. Dinah Eastop, University of Southampton addressed the role and part conservation plays in the process of representation and re-representation using case studies from her recent publication ‘Refashioning and Redress: Conserving and DisplayingDress’ Getty 2016. For us non-conservators the scientific data presented by RangiTe Kanawa, Aotearoa New Zealand, was mind boggling. She explained how an innovative scientific method analysing the black dye comprising of tannin and mud is being used to reconnect a number of unprovenanced Maori textiles to their place of origin. Jeremy Uden, Pitt Rivers Museum University of Oxford and Rachael Lee,Victoria and Albert Museum discussed the redisplay of one of the PRM’s most significant costumes, a Tahitian Mourners costume acquired by the naturalists on Captain Cooks second voyage. In 2011 Jeremy was awarded a grant from the Clothworkers Foundation to investigate and conserve the Cook voyage collection at the PRM. This led to the redisplay of the collection whereby Rachael Lee as a textile mount maker was recruited to remount the costume as it had never previously been done so before. The session was concluded with a paper from Luba D. Nurse, textile conservator and Patricia Te Arapo Wallace, University of Canterbury, Aotearoa, New Zealand on how improved technology and resources has led to the reinvestigation and challenged previous understanding of Maori dogskin cloaks. The day finished with a series of work in progress papers, nine in total that covered all areas of Museum practice, costume as learning and engagement resources, a donor’s view of donating collections to a Museum from Jenny Balfour-Paul who has lived an extraordinary life travelling the world in particular making numerous fieldtrips to the Middle East during her PhD on indigo in the Arab Word. Jenny’s collection of textiles from the Arab World has since been donated to the Pitt Rivers Museum. We heard about a number of new acquisitions of textiles at the PRM in Oxford and plans on reinterpreting the textile displays there in the future. Harriet Hughes treated us to a taste of contemporary African fashion using traditional fabrics, techniques and methods in innovative cutting edge ways. Krystyna Deuss discussed the importance of dating Cofradia textiles for dating Guatemalan weavings in general. Antonia Lovelace and Rosanna Nicholson took us to Asia with presentations on plans for an exhibition of Himalayan fashion in Leeds in 2018 whilst Rosanna has been researching Indonesian barkcloth collected by missionaries Leonard and Margaret Woodward in the collections of National Museums Scotland (NMS). Sue Giles and Lisa Graves gave us a glimpse of the idiosyncratic British Empire and Commonwealth Museum collection deposited at Bristol Museums, Galleries and Archives. The film and photographic archive material is rich in its painting of ex patriate life in the colonies, important political and historic events and day-to-day activities including transport, law enforcement, trade etc. in the British Empire and Commonwealth. I am sure it made many of us look forward to the potential of this collection for research and interpretation in the future. Racheal Hand finished the session with a look at kappa mu’umu’us from Hawaii in Museum collections and their meaning and use in Hawaiian dress and identity today. Having had our intellectual appetites well and truly fed by the end of the first day it was time to turn attention to feeding our stomachs! We were treated to a conference reception at the impressive Huntarian Museum a short walk up the hill through the historic University of Glasgow campus to the commanding building in which the Museum is housed. The exhibition gallery where we had drinks displayed some of the ethnographic collections including in a showcase which ran down the centre of the room displaying the Huntarian’s coconut armour from Kiribati which we had heard about earlier in the day from the Pacific Presences team. It was good after having had a day of lectures to reconnect and contextualise the material we all regularly theorise about and analyse with the materiality of the artefacts, a reminder of our privileged role as Museum professionals. The conference dinner was at one of Glasgow’s finest curry houses Mother India where we indulged in voluminous Indian dishes, many of us going home with doggy bags at the end of the night! Weary eyed I arrived for the second day of the conference which promised to be as stimulating as the first. The first session was focused on exhibiting and speaking through costume with the first paper of the day presented by Mark Elliot, MAA. Mark has recently curated the exhibition ‘Another India: Explorations and Expressions of Indigenous South Asia’ which is currently showing at MAA. Having a large collection of material in the PRM collections from the Naga Hills I was particularly interested in hearing from Mark of the challenges in displaying indigenous Indian communities. Mark suggested that as curators in putting together exhibitions we are the authors of curatorial fiction reappropriating material culture to make new cultural images. For the exhibition, Mark made the curatorial decision to reconstruct a Naga headdress from individual parts, not all of which belonged together but in doing so he was able to construct the most accurate representation of the headdress, another layer of human agency. This act has now become part of the object’s individual history and biography and those component parts that constitute the whole. Mark’s paper gave much food for thought with regards to curatorial practice. Our next speaker, Vanessavon Gliszcynski got the audience very excited with the talk of multi-disciplinary techniques bringing an exhibition about textile and cloth alive. Her exhibition ‘The Common Thread’ currently running in Frankfurt looked at textile technique as a means of interpreting textile collections. Working with contemporary artists and composers the exhibition incorporated art and music inviting visitors to experience fabric in a new and direct way. The exhibition created a new textile vocabulary, ‘the warp and weft of thinking’ and engaged with the cognitive challenges textile production presents making analogies for weaving with geometry, abstraction and musical thinking. A dynamic and innovate approach to displaying and interpreting textiles. I was very intrigued by Vanessa’s approach and made a note to purchase the exhibition book ‘The Common Thread,the Warp and Weft of Thinking’ for the Museum library. We then heard of the struggles of a local authority Museum trying to apply diverse and contemporary narratives to permanent displays. Rebecca Arnott introduced us Julius Brenchly, donor of the ethnography collections of Maidstone Museum. His position as a local Maidstone gentleman explorer privileges his role in the interpretation of world culture in the permanent galleries at Maidstone Museum. Through the use of talks and tours for public engagement it is possible to present other narratives and contemporary issues in the interpretation of the displays. Lindy Richardson, Edinburgh College of Art and Sarah Worden, National Museum Scotland provided us with a very animated presentation on a recent project using African commemorative cloth as a teaching aid for textile students in Scotland. In Africa, the cloths are used as political promotional tools particularly during local elections. The students created their own versions bringing attention to contemporary issues that concerned them today including the rise of celebrity culture, the threat to Scottish wildlife and the plight of Syrian refugees. Sarah hopes to acquire an example of the student’s cloth for the collections at NMH complementing the historical collections of African commemorative cloth and enhancing understanding of the role these cloths play in African cultural traditions. After coffee, we held the MEG AGM for which some members stayed. The AGM saw Antonia Lovelace hand over the reins as chair to long standing MEG member Sue Giles. The current committee thanked Antonia for her hard work and contribution to MEG over the past three years as chair. Antonia ceremoniously presented Sue with the MEG Chain of Office, a beaded necklace which all MEG chairs add a sort of talisman to at the end of their service. I did not see what it was that Antonia had added but will be sure to make a note to ask her. There was hint that the venue for next year’s conference could be the Royal Albert Memorial Museum, Exeter. The Museum has recently installed new Pacific displays and is currently working on redisplaying collections from Africa. The AGM finished early allowing for a slightly longer lunch and some time to reflect on the morning session and look forward to the afternoon. Session 6 was entitled ‘Reassessing and Revitalising Collections’, Sarah Worden continued on the theme of African cloth having recently been in Uganda where the traditional medium of barkcloth is being revitalised by fashion designers. Having been proclaimed in 2005 by UNESCO as intangible cultural heritage of humanity there are opportunities for apprentices in Uganda to train in barkcloth production. Sarah asked how do we go about collecting and documenting this changing role of barkcloth in Ugandan cultural identity, perhaps a question we should be asking more of all of our textiles collections which are being reinvigorated and repurposed at their place of origin. Contemporary collecting plays an important role in diversifying and updating our historical collections, Rachel Heminway Hurst, Royal Pavilion andMuseum Brighton explored the challenges in assembling contemporary collections in her paper ‘Fashioning Africa’. With a HLF collecting cultures grant Brighton Museum aims to make a collection of African fashion and textiles from 1960-2005. They have employed a methodology using a collecting panel consisting of African diaspora and academic specialists to advise and solicit acquisition. This methodology has proven successful in informing a collection which enhances the existing African costume textiles. If anything, we heard that the failings are with the collecting cultures grant which does not enable travel abroad. Mark Nesbitt, Royal Botanic Gardens Kew and Brittany Curtis talked of the collections from the voyage of the HMS Galatea. Of the 82 objects brought back from this voyage only 30 have been located within Museum collections to date. Interestingly we often concentrate on the acquisition of material and get fixated with what enters Museum collections and its history prior to acquisition. The objects history once it enters the Museum does get researched but Museum practice was once more fluid with a common network of exchange and transfer among curators and collections. In MEG style, the paper perpetuated the ‘Lost and Found’ nature of ethnographic collections. Louise Wilkie rounded up the session with news of a continuation of project funding to work on collections at Aberdeen making the collection there very much ‘open for research’. It was only apt that the last session of the 2017 conference should be focused on barkcloth and introduced with a paper by anthropologist Adrienne Keapler, curator of Oceanic Ethnology at the National Museum of Natural History, Smithsonian Institute and Co-investigator on the barkcloth project based in Glasgow. Adrienne reminded us that the strengths of our collections relies on good documentation. However, in the absence of documentation methodologies can be applied in the identification of barkcloth if components and combinations of cultural signatures can be found. As a non barkcloth expert I was interested to learn any tricks of the trade and found Adrienne’s lecture useful but also couldn’t help to think that the ability to identify barkcloth as described must also rely on an expertise gained from years of study, research and knowledge accumulation. Andy Mills provided us with one of the most imaginative analogies of the day in his discussion of the fractal and partible nature of barkcloth comparing its division and distribution to having an apple, slices of apple, a fruit salad or apple juice. Tensions exist among the Polynesian diaspora over the subdivision and distribution of barkcloth, however the very nature of the cloth undermines such tensions. Patricia Te Arapo Wallace examined two unusual 18th century Maori cloaks and the engagement of contemporary weavers to better understand their construction and gain new knowledge and understanding acknowledging that historic collections provide evidence of techniques no longer practiced. The closing paper of the conference came from Antje Denner, NMS and Racheal Hand, MAA and their endeavour to shed light on the Polynesian barkcloth in the holdings of the NMS. By matching pieces with sample books and pieces of cloth in the collections of the National Museum of Ireland it is hoped that the histories of these cloth and individual Museum histories of collecting, distributing and assemblage can be answered. This drew to a close the 2017 conference, I had a plane to catch and so had to leave whilst questions and discussions for the afternoon session panel continued. As always, I left the annual MEG conference feeling content that as those who work with ethnographic collections we continue to be innovative, critical and questioning of our actions as curators, researchers, conservators. I knew that the conference focus around costume and cloth would arouse interesting discourse and I certainly wasn’t left disappointed. Assistant Curator, Pitt Rivers Museum.